Choose Monstermove Removals – But Why? Apart from the obvious one which is ‘well you just should!’. There are lots of reasons why you should opt. to hire Monstermove Removals Hull to carry out your home or office removal. Those of you who have already used us to relocate, or those that follow our Blog will know that we aim to be among the best in the business. We think that you should choose Monstermove Removals, first and foremost because we are a good, honest team with the right intentions. Our aim is simple – to do things properly. We are a close team of friends, all with the same aim, the same outlook and the same vision. Because of this we have devised a game-plan. Our game-plan includes carrying out each and every job that we do to its fullest potential and leaving every customer, a happy customer. We are a professional removal company and are experienced in our field. We carry all of the necessary insurance, equipment and accessories to carry out our work to the highest standard. Our vans are the life-blood of our business and so are maintained by a local garage who specialises in Ford vehicles called Mastertech, with no expense spared. Our vehicles are also covered by the RAC for commercial breakdown assistance so your property is guaranteed to reach its destination, no matter what! It takes a good bit of equipment and accessories to minimise potential inconvenience whilst carrying out a house/office removal. We have a wide range of tools of the trade so that things run as smoothly as possible. This may sound like an odd example to start with but the amount of times we see people advertising a removal service along with plastering, building work, gardening, waste removal and more, makes us wonder how clean these vehicles can actually be. I couldn’t imagine using the same vehicle for any of the above and then using it to transport a customer’s house contents. Our vehicles are used for moving furniture only. Sure we move plants and garden ornaments too but you will never hear of us carrying waste. We do not hold a waste carriers license and are not authorised to visit any waste/recycling facility or scrap metal yards. Our sofa wraps. Keeping your sofas safe during move day. You can choose Monstermove Removals because our vehicles are armed to the teeth. The accessories that our vehicles carry is to keep your property safe during the removal. Minimising the risk of damage and is a factor in the fact that we have never been in a position where we have had to claim on our insurance. You can click any of the photos in this article to view a larger example. Some of the equipment that we carry is as follows.. 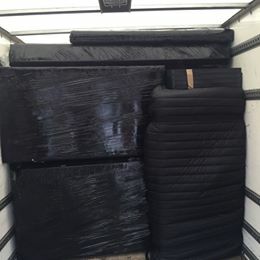 Transit blankets – These are thick, woolly blankets which we wrap your furniture in whilst inside the van. They offer protection against scratches, and the general risk of being moved. Ties – We use ties and webbing to secure your property in place after they have been wrapped in our transit blankets. Ties eliminate the risk of furniture falling, moving and knocking against each other whilst the vehicle is in motion. They essentially fix the cargo in place for the duration of the drive. Sofa Wraps – These are a purpose made bit of kit which encapsulate your sofa in a padded and waterproof sack. 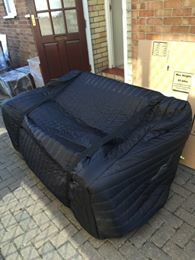 Your sofa(s) are contained in these before they leave their place of origin and do not see the light of day until they are in place at their new home. Protection of this nature reduces the risk of scratches and scuffs whilst manoeuvring them through doorways and tight spaces. It also allows for them to be placed on the floor without picking up any dirt. Mattress Sacks – We believe that mattresses are a personal item. You do not want your mattress putting in places where other people’s mattresses have been. In fact, you don’t want your mattress being anywhere except your bedroom really! To combat this hygiene issue, we use disposable wraps for all of the mattresses that we handle. Our mattress sacks are made of polythene and cover your mattress entirely before being taped up and sealed away from the outside world. Your mattress will never touch the floor outside of your bedroom, it will never make contact with the inside of the van or a transit blanket which has been in contact with another mattress. We see this as a small touch with a huge advantage. Shoe/Boot covers – These look a little like shower caps! We wear them over our feet in wet conditions to reduce the risk of bringing dirt into your home. Tools – All of our vehicles are well equipped with tools. We often need to dismantle a bed or wardrobe so bring the kit we need to do so. The chances are that on move day, your tools will be packed and finding them would be a real pain. No worries, we’ve got it covered! Wardrobe Cartons – These are tall, plastic cartons that have a rail inside. We simply remove the contents of your wardrobe and hang them in our wardrobe cartons ready for transit. Being hung during transit is far better than being crammed into a box. It eliminates ironing for a start! And is ideal for expensive garments. Each one of our vehicles is equipped with three wardrobe cartons. Each capable of carrying around 25 shirts, or the equivalent of. Our wardrobe Cartons. Yes that is a Piano! Furthermore we carry little oddments like tape, a few boxes and those two things, what do you call them again? Oh yes, the removal men! I should have maybe added them to the ‘tools’ bullet point! Running a professional removal company requires several layers of insurance. Handling customers’ worldly possessions on a daily basis and driving up and down the country carries a certain element of risk. Going without any of these layers would be irresponsible, even whilst carrying out our work as carefully and methodically as possible. Our vehicles are covered by a fleet policy with Basil Fry who are a specialist insurance company serving the removals and storage trade. We have used several insurance companies over the years and have settled with Basil Fry. They know our industry well and cover all of the key-aspects that we need in our line of work. Our public liability insurance (£2m) is covered with Direct Line for Business along with our Employer’s Liability. Two more layers of protection for everybody involved in our work. We carry goods in transit insurance up to the value of £25,000 as standard. This safeguards all of the items that we handle. If you feel that your home or office contents exceed £25k, please let us know prior to your removal and we will have it raised for the duration of your move. Our GIT insurance is help with Invicta Insurance. We will be transferring our GIT insurance to Basil Fry when it comes up for renewal. We hope that we have helped in your research on our company with this article and certainly hope that you are one step closer in making the decision to choose Monstermove Removals to carry out your relocation. I have been as transparent as possible and tried to cover all of the questions that we get asked most often. 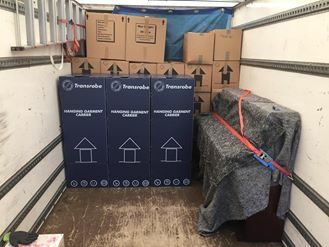 If there is anything that you feel that I have missed out or we can provide any information that will help you to choose Monstermove Removals then please get in touch using any of the contact details on our contact page.